Designed by Matt Goodall with the Legendary Games design team of Jason Nelson, Neil Spicer, Clinton Boomer, Greg A. Vaughan, Russ Taylor, Jim Groves, and Clark Peterson, with amazing art by Jason Juta and magnificent maps by Rob Lazzaretti. Who better to provide you with supplemental adventure material for your Adventure Path campaign than the very writers of those adventures themselves? Answer: no one. Legendary Games' Adventure Path Plug-Ins supplement and enrich your campaign experience, offering adventures and supporting products that incorporate and expanding upon unique concepts, themes, and rules subsystems introduced in the Adventure Paths while filling in the background characters, items, and locations that make those adventures come alive in delightful (and often dangerous) detail. Legendary Games combines stellar writing talent with innovative layout and product design and top-notch artistic values that we think will bring you back again and again. 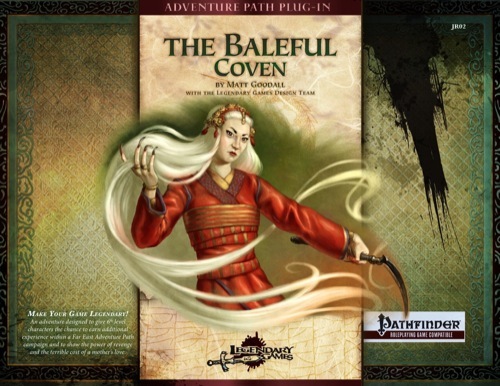 The Baleful Coven is a sidetrack adventure by Legendary Games in the Far Easter product line. 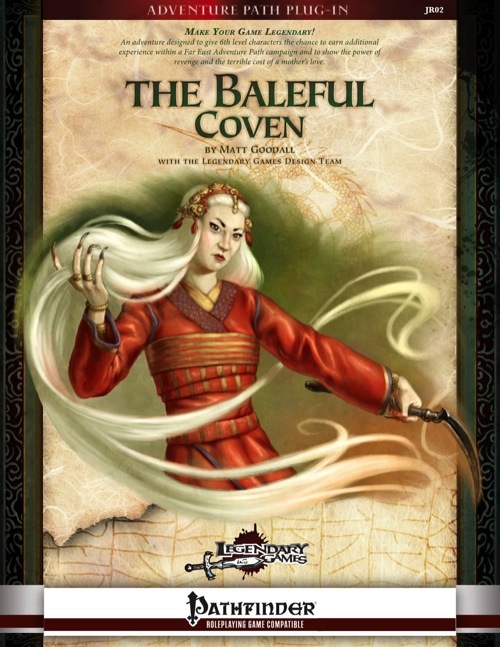 It combines a hag, a winter witch and a white-haired witch, who form an unlikely and unusual coven in their quest for vengeance against the PCs (because of their actions in the main Adventure Path) in a dreamlike, Ravenloft-esque mini-demiplane that the PCs have to escape from. While not as genre-stretching as “Under Frozen Stars”, this adventure is just as good! I really liked the encounters herein, especially the ones with the “sisters”, my favorite being of course the white-haired witch. If you have seen the movies The Bride with White Hair and/or The Forbidden Kingdom, you know what I mean! This pdf is 25 pages long, 1 page front cover, 1 page editorial, 1 page ToC, 1 page how-to-use, 1 page author-bios, 1 page SRD, 1 page back cover, leaving us with 18 pages of content, so let's check this out! Still here? All right! Intended to be used for 6th level characters between installment 2 and 3 of the Jade regent-AP, this pdf kicks off rather starightforwardly - by stranding the PC's caravan in a specifically-crafted demiplane sans escape - a place where the mastermind villains can exact their vengeance. When the PCs are faced by weird dreams seeking to drive them mad and make them see how their actions justify their punishment (in the villain's twisted logic), they'll sooner or later understand that in order to escape this weird place, they'll have to find their tormentors and deal with them. The originators of the dreamplane-prison is an uncommon coven consisting of an annis hag, a winter witch and a white-haired witch, with each of the 3 members having their own section of the dreamplane and its own dangers. The annis lords over an ice-cold hall in which a jarl and its thanes invite the PCs to partake in their celebrations - while drinking the poisonous mead will seem unwise at first, at least it will keep the undead from attacking them by keeping the rules of hospitability intact. The Winter Witch's demesne is no less exciting, featuring the new CR 4 Arctic Harpspider-monster as well as exciting locales that truly influence the battles. Finally, the white-haired witch's demesne is set in a lost village, complete with its own pagoda and shadow mastiff-guardians. Editing and formatting are top-notch, I didn't notice a single glitch. the pdf adheres to Legendary Games' drop-dead gorgeous 2-column landscpae standard and the pdf comes with a backgroundless version. The pdf is also available as a portrait-version. The maps. O. M. G. The maps. so beautiful they make the eyes water, the domain's map being one of the finest ever. Each area comes with drop-dead-level paizo-quality-plus gorgeous maps, making me regret that we don't get them as high-res map-packs, but even when printing out the pdf and handing this to your players, their jaws will drop. seriously. The pdf is extensively bookmarked and the artworks are of paizo-level-plus quality with all mayor antagonists getting beautiful, original pieces of artwork and the same holds true for the new creature. And then there also are mood-piece-artworks. WOW. This sidetrek/plug-in has a simple structure - but it's fluff is glorious! Exciting! Weird! Dream-like! Seriously - even if you don't run the Jade Regent-AP, get this! It's that good! It's a short, sweet adventure brimming with superior production values, cool ideas and a very distinct "fairy-tale gone horribly wrong"-vibe. Final verdict? Easily given 5 stars + seal of approval - this would be worth the price for the maps alone! Get your copy today! It's awesome! Thanks guys, Tim's layout, Jason Juta's art, Rob's maps, and Jason Nelson's developing skills all make the product (and me :-) look good, really good! Matt, absolutely amazing work on this. Totally great! LG is bringing it, for sure. I am so, so proud of the stuff being put out by LG. I am also, personally, so proud of you to see your career really taking off. I knew you had the mojo back in the 2010 Superstar contest. Winning really takes an amazing run. Matt made it easy to make his adventure look good by turning in an adventure with a lot of great scenes and rich fodder for creating some exciting visuals. I was blown away by the maps Lazz created that really bring home the dream-like quality Matt put into the adventure. Very cool. And Jim, if you liked the cover, check out the interior art. I may post my favorite piece, a nightmarish scene reminiscent of a scene from Beowulf! I am reading it and have a question. In Jorunea's domain. the side bar on page 10 called "a Shroud of death" It lists that Mirage Arcana is used and to allow the PC's a secret saving through. Am I missing the save DC for this spell? The mirage arcana and veil are coven spells so the DCs are 18 for the mirage arcana and DC 19 for the veil. Thanks for the cool review Endzeitgeist! Endzeitgeist, your review made me pull the trigger this morning. I knew I was going to get it eventually, but the thorough description of the plot sped that process up. Radiarch Eklesya, thank you for your vote of confidence in my review and I hope you had happy holidays and will have a happy new year! Typo: on page 16, in Uraba's statblock, both "winter witch" hyperlinks lead to the archetype entry. I presume the second is intended to link to the prestige class? Nifty stuff in general. I understand you're doing some Kingmaker stuff in the near future, do you have any kind of ETA on that? I'm probably going to start a KM campaign in the next month or so. Neil is hard at work on an upcoming AP assignment, which has put a bit of a crimp in his completion of Conquering Heroes, his NPC pregen product for KM, but he should be able to get clear and finish it up by late Jan or early Feb.
Ironically, given that we are in the thread for his adventure for our Far East AP Plug-Ins, Matt Goodall is also beginning work on a similarly leveled adventure for that AP. I'd estimate February for completion on that. Other products are in various stages of completion but are also working in and around our other ongoing product lines. So, in answer to your question, I'd estimate next month is when you should start seeing KM-related products from Legendary Games! I'm going to be plugging this in between the city of Ordu-Aganhei and the Forest, but before the spirit encounters start. Should be somewhat wooded to start it off. For my 7 person party I'm bumping the ELs by about 5. lots of monster advancement. Thematically it should be great. Let us know how it goes. Her BAB is 4 and her modified Str is 18 (+4)... I've been trying to figure out where the extra +2 is coming from, but, for the life of me, I can't account for it. I'll send a note to Matt to check in on this thread and perhaps he can explain. Thanks for pointing it out. Heroism. Bonuses to attack rolls are added to combat maneuver checks. I'm planning on running this as soon as my characters get out of Ravenscraig (I was already planning on having them run into Goti's mother and when I ran into this book I was elated). The Amatatsu Seal can never be transported by teleportation magic or dimensional travel. It cannot be taken from the Material Plane save via special portals blessed by the gods, and characters who carry the seal cannot cast or otherwise use teleportation effects. How can a caravan carrying the seal enter the demiplane? Demiplanes, traditionally, have not been consistently qualified as fully realized planes, but rather as basically shreds of the plane from which they originated; at least when they were anything else but the dominion of a powerful outsider. Examples include Ravenloft, which, for most intents acts more like a material plane (though a jealous, malignant one) or the demiplane of dream, both of which traditionally do not require plane shift of similar magics to enter. Heck, the latter is entered on a daily basis by some folks. Similarly, there are a ton of precedence cases in which a wizard's sanctum sanctorum is not treated as a plane, but rather as a location on the prime material plane, albeit one that occupies an impossible space. Perhaps it's the years of Ravenloft-GMing, but at least that's how I handled this when I played Jade Regent back in the day; to see the demiplane as a plane for the purpose of the seal never even crossed my mind. So yeah, that's how I handled this. my players probably wouldn't have even noticed, but my OCD kicked in and I was having trouble rectifying it. Reviewed after 4 years of purchase.